A comforting bowl of marinara soup comes together in only 20 minutes for a quick and easy vegetarian dinner. 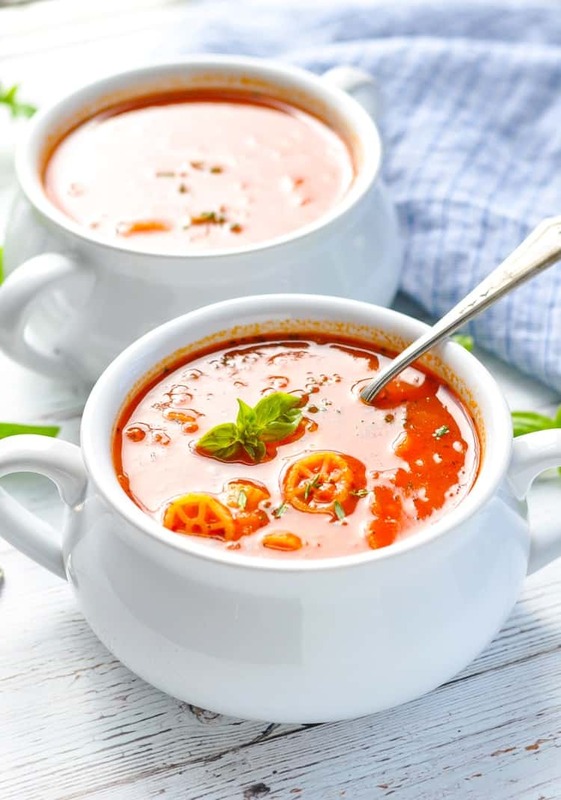 A comforting bowl of Marinara Soup comes together in about 20 minutes for a delicious, simple, and healthy vegetarian dinner! 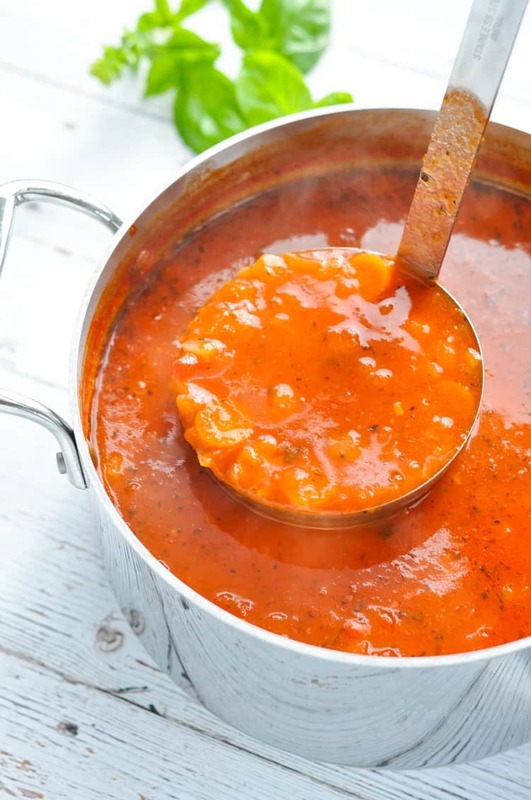 The recipe and text for this Marinara Soup were originally posted in September, 2014. The photos were updated in November, 2017. With the arrival of fall, I get more and more excited to return to some of the cozy meals that I have avoided in the dreaded summer heat. While cold salads and sandwiches tasted great last season, I’m now looking forward to warm bowls of soup and bubbling hot casseroles. Beware — you’ll see a lot of these things on the blog in the next few months! Just because it’s comfort food; however, does not mean it has to be unhealthy. 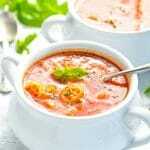 I love that this marinara soup is quick and easy to prepare (even faster than ordering pizza! ), but it also includes so many nutritious ingredients. What’s In This Marinara Soup? The recipe comes from my dear friend Mary, who gave it to me a few years ago after a visit to our house. While Mary was visiting us for the day, I served her a gourmet lunch (hah!) of grilled cheese sandwiches and tomato basil soup. She loved my tomato basil soup and asked for the recipe…and then she gave me this recipe for Marinara Soup in return. A pretty fair deal, I’d say. 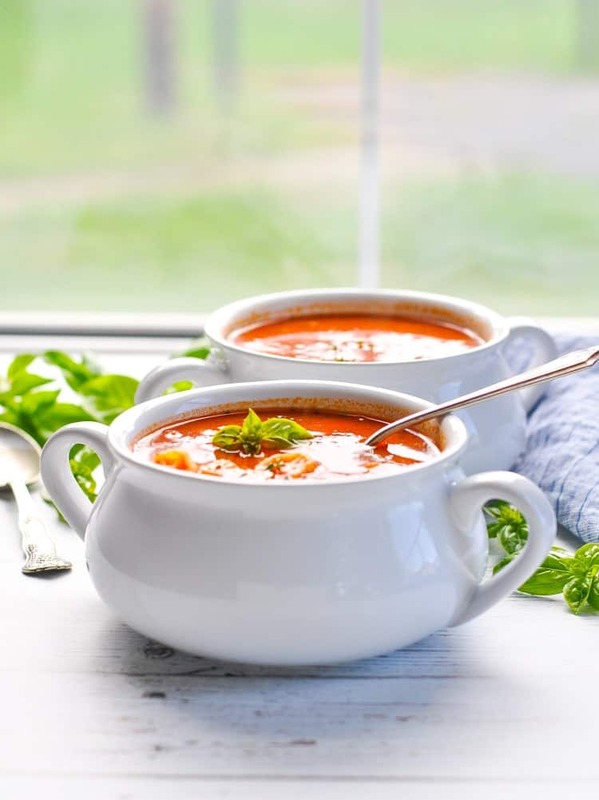 I have since learned that the original Marinara Soup recipe came from celebrity chef Giada de Laurentiis. No wonder it’s so good! Mary got it from her friend, then Mary passed it on to me, and who knows where Mary’s friend first found it! Obviously the recipe is a keeper that gets shared among loved ones! 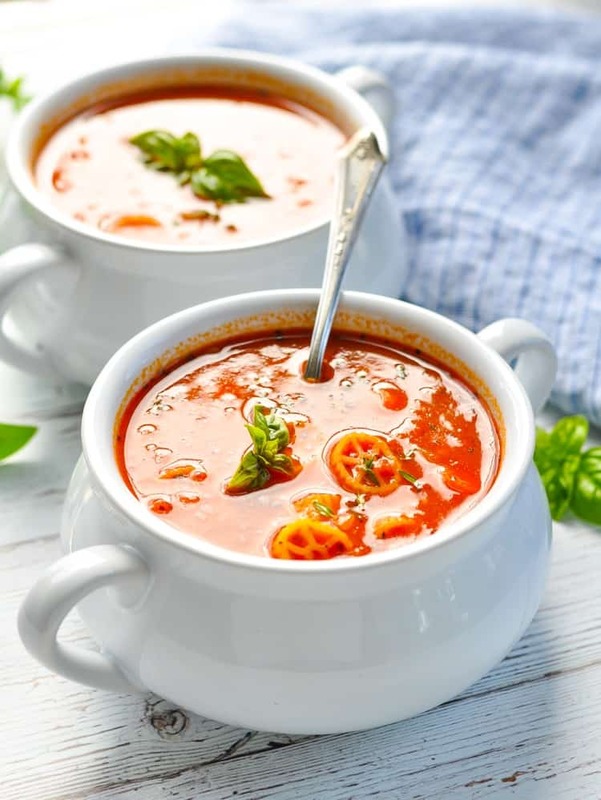 The Marinara Soup is the perfect twist on a classic Italian vegetable or Minestrone soup. The beans and pasta give it some staying power, while keeping it vegetarian (like Mary!). The soup makes a nice good-for-you lunch, but I usually serve ours for dinner. In fact, I recently paired it with my Tuna Melt Sliders for a supper that all of my boys gobbled up (baby Spence included! ), leaving their tummies very happy. Give this one a try this season — I promise that you will not be disappointed! 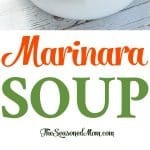 If you’ve tried this Marinara Soup or any other recipe on The Seasoned Mom then don’t forget to rate the recipe and leave me a comment below! You can also follow me on Facebook, Twitter, Instagram and Pinterest to see what I’m getting up to. Warm the olive oil in a large soup pot over medium-high heat. Add the carrots, onion, and garlic and sauté until soft (about 2-3 minutes). Add the jar of marinara sauce, chicken broth, beans, uncooked pasta, salt, pepper, and red pepper flakes. Simmer, uncovered, for 10 minutes. Ladle into bowls and serve. Recipe adapted from Giada de Laurentiis. Thanks, Linda! I hope that you get to enjoy it. The soup is SO delicious! YUM! This looks so good, and such a delicious way to celebrate the cooler weather. This would make a perfect quick school day lunch. I’ll be serving this one one as soon as the temperatures drop a bit. Thanks for sharing. Pinning and sharing on my Facebook page today. 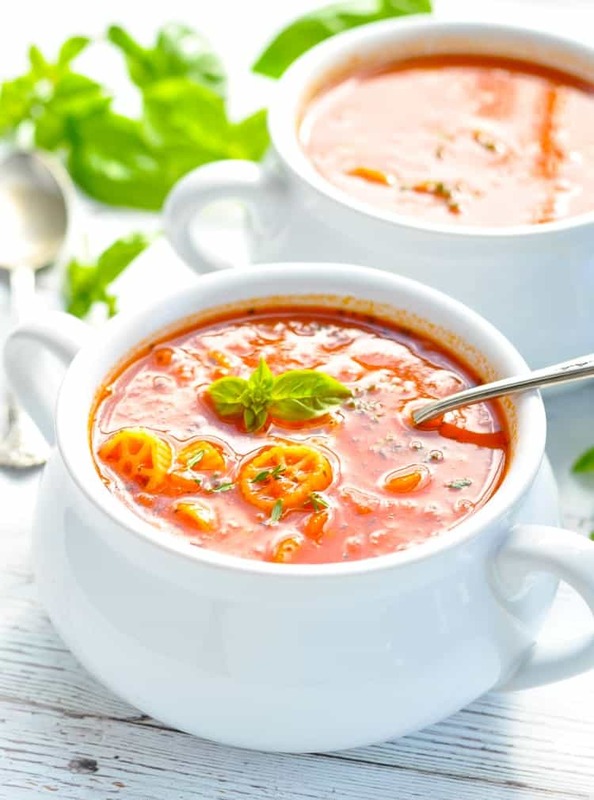 What a quick way to make a really different tomato soup. Pinned. Thanks for the pin, Diane! This would make a great lunch for me while the children are at school! Thanks, Ashley! Yep — I’ve enjoyed it for many lunches!! Mary should have told you that this is a Giada De Laurentiis recipe so you could give proper credit. This soup sounds so good! nice touch adding the cannellini beans, and I love those bowls you served the soup in, trying this recipe out today for lunch! You’re welcome! I’m glad that you enjoyed it, Aleta! This looks like an absolutely delicious dish. 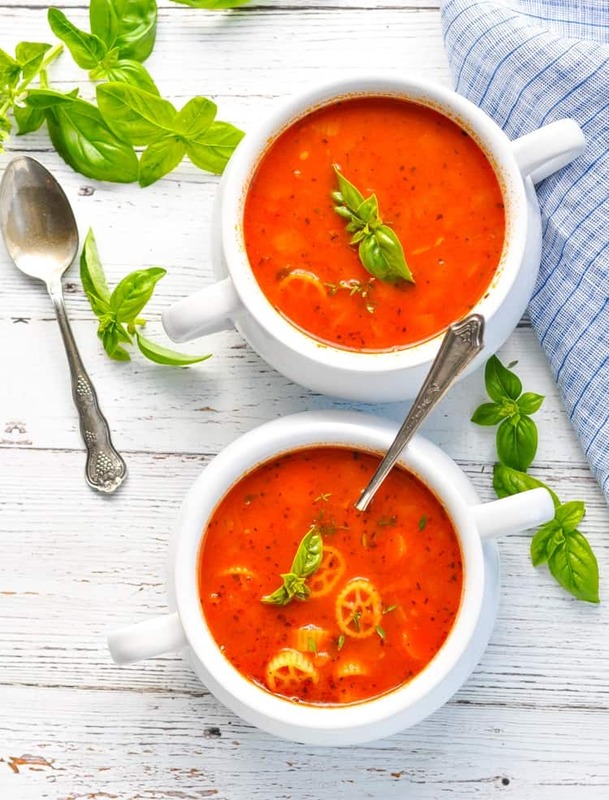 I’m usually starting to eat more soups during the winter as they keep you warm… and this marinara soup looks like one that warms your soul too 🙂 I’ve already put it on my to do list. Wow. Looks delicious. Beautiful photographs. Pinning and trying this very soon. 🙂 Thank you! What a great idea to add beans it sounds so hearty and perfect for winter…drooling over the photos! This looks great! Does it freeze well? I want to make it tonight but serve it in appetizer portions for a dinner party I’m having this Friday.